It was reported as “the largest demonstration that had ever been held at Lambton” with the crowd numbered “upwards of 2000.” The occasion was the return to Lambton of Lieutenant Albert Henry McEwan from the South African Boer War. Albert was born in Lambton around 1877 where his father John worked as a miner. In the 1890s a downturn in the coal trade induced many to leave the area and seek work elsewhere. In October 1895, John along with his eldest son Albert, still a teenager, headed to the booming gold fields of South Africa. Both father and son quickly found employment in the “Simmer and Jack” mine at Johannesburg. Within a year John was tragically killed in a mining accident. Albert stayed on and rose to a responsible position in the mine. When war broke out in 1899 between the British and the Boers, he joined the Imperial Light Horse and was soon engaged in a number of battles. Describing these in letters home to Lambton, he wrote with patriotic bravado but also noted “the appalling sights of a battlefield are simply terrible”. In 1901 Albert was shot in the leg. He was treated in South Africa, before being taken to Netley hospital in England where his leg was amputated. Albert returned to Australia and arrived back in Lambton in the afternoon of 14 April 1902. At 7pm a torchlight procession marched down a gaily-decorated Elder St to Bell’s Hall at the corner Morehead St. “At every corner the returned soldier was greeted with loud cheers.” He made an appearance on the balcony and addressed the crowd in the street below, before being entertained at a banquet in his honour. 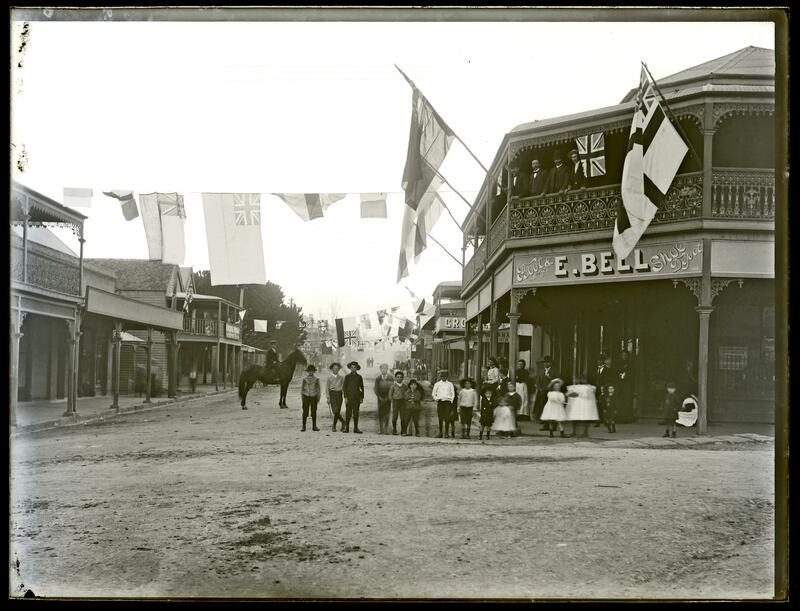 Ralph Snowball’s photograph from this day is not only a snapshot of the streetscape of Lambton in 1902, but also an indication of the colonial fervour for the British Empire that would propel many more Lambton boys to the fields of the Great War in Europe 12 years later. 14 April 1902 – A decorated Elder St in readiness for the torchlight parade to honour Lieutenant McEwan later that evening. University of Newcastle, Cultural Collections. The article above was first published in the August 2018 edition of The Local. The amalgamator at gold mines prepares amalgamation plates to receive the gold-bearing pulp from stamps. He regulates the flow of water and ore, and at regular intervals collects the mercury-gold amalgam from the mortar, sluices, and plates. The National Archives( London, England), has scanned the nominal rolls for the Imperial Light Horse Brigade, which contains an entry for Albert Henry McEwan. His enlistment date of 25 September 1899 was some two weeks before the Boer Republics declared war on 11 October 1899. 28 Oct 1895 "On Monday night a large crowd of residents gathered at the tram stopping place to witness the departure of Messrs. Jos. W. Oldham and John McEwan and son for Johannesberg, South Africa." "Other well known residents … also leave their homes this week for Western Australia, slackness of work resulting in this step." 19 Oct 1896 "A communication was received yesterday from Mr. Joseph Oldham, of Simmer and Jack (South Africa), conveying the sad news that his friend and brother-in-law, Mr. John McEwan, had died on the 19th of October from the effects of an accident in one of the mines. It appears that the deceased was with two other men, engaged in timbering a shaft, and that in endeavouring to cross the shaft he slipped from a plank they had for a stage, and fell a distance of 60ft." 13 Dec 1899 "Trooper Albert McEwan, of the Imperial Light Horse, now in active service at the front in Natal" writes to his mother at Lambton.
" … you see I can call myself a thorough soldier, having fought against the Dutch in two battles — Elands Laage and Umgaani." "The appalling sights of a battle field are simply terrible. You read about such affairs in books, but seeing such sights is fearful." 28 May 1900 Letter from Trooper Albert H. McEwan, of the Imperial Light Horse to his brother William in Lambton. 5 Jan 1901 "Mrs. McEwan, of Lambton, has received word from Major Rodgers, the officer commanding the Imperial Light Horse depot, Johannesburg, that her son, Sergeant A. H. McEwan, had been dangerously wounded at Fredrickstand, in a severe engagement with a Boer commando under De La Rey." 14 Apr 1902 Celebrations marking the return of Lietenant Albert McEwan to Lambton after serving in the Boer War. 14 Apr 1902 The Daily Telegraph in Sydney reported that "Lieutenant A. H. McEwan returned to his home at Lambton yesterday, after an absence of many years, and was accorded an enthusiastic, reception both at Newcastle and in his native suburb." 22 Mar 1941 Death of Albert Henry McEwan in Adelaide, aged 64.